OtterBox has announced an initiative to support the Avon Breast Cancer Crusade with a limited edition pink and white case for BlackBerry smartphones. 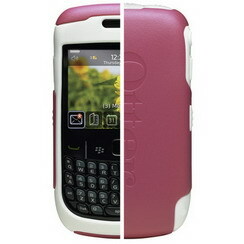 The first in the series is the OtterBox Commuter Series “Strength” case for the BlackBerry Curve 8500 series smartphones. OtterBox will donate 10 percent of the purchase price from each case to the Avon Breast Cancer Crusade to support research to find a cure for breast cancer and programs that provide access to breast health care, regardless of a person’s ability to pay. The first in the series, the OtterBox Commuter Series “Strength” case for the BlackBerry Curve 8520 and 8530, is dedicated to people who are fighting or have survived breast cancer, as well as those who have lost the battle against breast cancer. Three slender, yet sturdy layers offer tough protection in a sleek package. With a slim form factor and smooth outer layer, this case slides easily in and out of a pocket, purse or bag. When you purchase the OtterBox Commuter Series "Strength" case for BlackBerry Curve 8520 & 8530, 10% of the purchase price will be donated to the Avon Breast Cancer Crusade. OtterBox is a proud corporate sponsor of the Avon Breast Cancer Crusade and the 2010 Avon Walk for Breast Cancer series. “Strength” cases debuted last night in time for Mother’s Day at the 2010 Wireless Enterprise Symposium (WES) and are available for $34.95 at www.otterbox.com and www.shopblackberry.com. OtterBox has pledged a minimum contribution of $50,000. 0 comments on "Pink OtterBox Strength Cases for BlackBerry Support Avon Breast CancerCrusade"